The Display It presentation system gives you a professional and impressive way to showcase your announcements, documents posters or photos. The system’s acrylic frames are easy to mount and adjust to the desired height. Thanks to the E-clip for Display It, you can change the contents of the acrylic frames in seconds. The clip also makes it easy to connect the frames to one another, making both horizontal and vertical displays possible. This display system is ideal for estate agents and is often used as a ‘face wall’ for photos of staff displayed on the wall in hospitals and other institutions. Display It is available in Flex and Fixed mounting models. The Display It Flex version is used in combination with a hanging rail and stainless steel rods that are easy to re-position along the rail. The economy version of ‘Display It’ enables you to create a sleek photo wall at home or the office. You can combine frames of different sizes (A3, A4 and A6), and you can change photos in an instant. 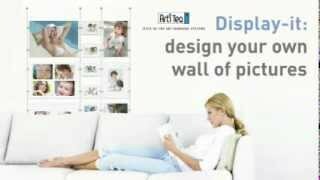 Display It Economy may be mounted to the wall or hung from our flexible picture hanging systems. A6- 148mm wide x 105mm high (6 x horizontal holders, 2 x e-clips per holder, 2 x cables). E-clips let you to rapidly change pieces quickly and link extra columns. No special tools needed. The addition of a Flex Tension Cable Set or a Fixed Tension Cable Set allows you to tension between surfaces. If you’d like to display oversize pieces or mounts between 3-6mm thick, then use our ‘Display It Solo’ kit.